Americans love TV and the Internet, but they really, really hate the companies that bring it to them. Customer satisfaction with cable and broadband providers has reached a low point, according to a new survey released Tuesday. And Comcast, the No. 1 cable provider in the United States, has fallen to a record low. Comcast (CCV) got a score of 54 out of 100, down from 60 last year, for cable TV service, according to the American Customer Satisfaction Index. The company hit 54 once before, back in 2008. The No. 2 cable company, Time Warner Cable (TWC), which Comcast tried to merge with, has an even lower score -- 51. That is the lowest score for any of the 300 companies that are included in the ACSI's survey of 70,000 people, from Bank of America to UPS, Marriott to Delta. Last year, Time Warner Cable had a 56. Customers cite problems with HD picture quality, frustrations with on-screen program guides, and call centers, just to name a few. 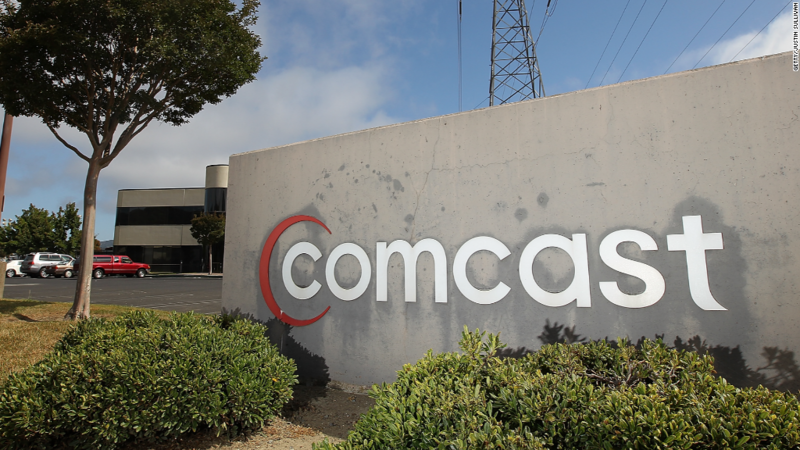 Comcast and Time Warner Cable say they have been stepping up their efforts to improve service. The pair of companies may have been hurt in the survey results by the bad press and scrutiny surrounding their attempted merger. At the end of April, the two companies called off their deal, citing the government's intent to block it. Time Warner Cable is now seeking to merge with Charter Communications (CHTR), the country's No. 3 cable provider. Charter has a notably higher ACSI score -- 63 this year, up from 60 last year. Related: Charter merging with Time Warner Cable: what now? Overall, cable providers and Internet service providers have the lowest scores of any of the 43 industries studied by the ACSI. This year's deterioration "is a result of poor customer service combined with higher prices," ACSI researchers said in a report. "Customers resent being locked into service contracts, and are not happy with what they see as unreliable service, slow broadband Internet speeds, and rising subscription prices," the researchers said. There is "much room for improvement across the industry." The country's two big satellite providers, DirecTV (DTV) and Dish Network (DISH), continue to rank higher than the major cable TV providers. They had a 69 and a 68 this year, respectively. AT&T's TV service also has a 69, and Verizon (VZ) FiOS tops the industry with a 71, up three points from last year. The ACSI survey is a well-respected measure of customer opinion. Earlier this week Consumer Reports released similar data, which found that "consumers continued to express dissatisfaction with their TV and Internet providers, giving most poor reviews for value and overall satisfaction."